The cost of the funeral is made up of three parts. To determine the total cost of a funeral the three separate parts have to be added together. These are fees that the funeral director pays on your behalf. Fees at the crematorium or cemetery, the minister's fee or fees for a church service, the organist's fee and for a cremation the doctor's fees for completing the statutory cremation forms. What are the funeral packages? We normally offer a "package" where the cost of the funeral varies depending on the choice of coffin or casket that is chosen and the services provided within the package. All our normal services are included within the cost; these are the removal, hygienic treatment, viewing at the Chapel of Repose, arranging the funeral, providing a Hearse and bearers and most provide at least one limousine for the family. We offer Green Funerals for the environmentally friendly within our range. We also offer a Simple Basic Funeral which provides the essential requirements with the minimum ceremony. Such as, additional limousines, newspaper notices, floral tributes or funeral stationery which we will be happy to order on your behalf. Perhaps there will be additional charges for the disposal of cremated remains after a cremation. If the death occurred, or the funeral is to take place some distance from our office, a mileage charge may apply. All charges will be explained verbally at the initial interview, and a total estimated cost will be provided in writing before the funeral takes place. Our fully itemised account is sent soon after the funeral. If you decide that floral tributes are appropriate, in memory of the person who has died, you may invite people to send flowers in a variety of ways. All flowers - anyone who would like to send flowers can send them to our office. Family flowers only with donations to a charity of your choice. Either flowers or donations - giving people a choice. Some people request no flowers at all, and people may donate to a charity if they wish. We will gladly order flowers for the immediate family or recommend a florist. A record of those who send flowers to our premises is kept and we provide a list of floral tributes for the family. After the funeral we are often asked to take cut flowers to a local nursing home or hospice. If you decide that donations are appropriate the family, nominate a charity and invite people to donate in memory of the person who has died, either on the day or go online. We are pleased to collect the donations on behalf of the family. We normally acknowledge receipt of donations to the donor. The total amount collected is passed to the nominated charity. The family is provided with a list of donors approximately one month after the funeral, including the total amount, and forwarded to the charity. You can contact the paper directly or we can assist you. Our funeral directors will be pleased to assist you to draft a newspaper notice and can provide suitable words, quotes or verses if required. You may like to announce the funeral and the choice of flowers or donations. You need to give some thought to the paper in which you would like the notice to appear. We can place the notice for you in any local or national newspaper. We will submit thanks notices after the funeral if requested. Family members and friends usually get together after a funeral. This may be at their house, a village or church hall, a hotel or sometimes a club or public house. We will be pleased to recommend venues or caterers to suit your requirements. In certain circumstances, assistance may be obtained from the Department of Work and Pensions (DWP) towards the payment of funeral expenses. How do I deal with the estate? Depending on the size of the estate and if a will has been left, the Probate Office, Tel: 01208 - 261581 may need to be contacted, or legal advice obtained. The Department of Work and Pensions issue a very useful guide entitled “What to do after someone dies” available to download on their website at www.gov.uk/after-a-death. Can I get help from the DWP towards the cost of a funeral? • The disability element of Working Tax Credit. Can you advise on Memorials? We will be pleased to give advice or arrange the memorial if requested. Any other topics I should know about? We practice temporary preservation (embalming) under modern hygienic conditions. 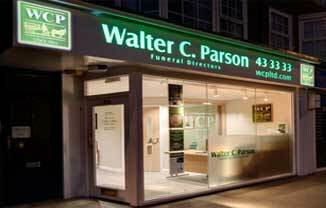 We believe all progressive funeral directors should do this as part of the service they offer. Besides the benefits to health both for you and all our staff it also allows visits to the chapel of rest until the day of the funeral. How should we dress for the Funeral? Dress varies according to the style of an individual funeral, today more variation is allowed without being considered disrespectful. Most people show comfortable respect in their dress at funerals. Our own staff wear morning suits. What if the deceased has a heart pacemaker? If the deceased is fitted with a heart pacemaker, this should be removed. For a cremation this is compulsory, and for a burial this will avoid a charge from the National Health Service. If a pacemaker, or any similar implant is fitted, it is important that you advise us. We will then remove and return it to the local Health Authority for you. Where can I get further advice on Funerals? We regularly hold talks to give explanations and to answer questions on funerals to clubs, groups, training courses etc, so please feel free to contact us at any time.